About any field of study can be full of unique terms and names that may be confusing to some. Nomenclature used when referencing wagons and coaches is no different. Things like a king bolt, sand board plate, rub iron, outer bearing axle, rocker, hammer strap, box strap, brake shoe, drag shoe, slider, clout, fifth chain or even the ‘gather’ of a wheel can be challenging to audiences if not properly explained. 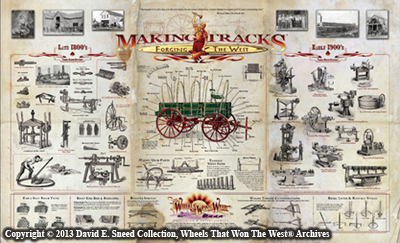 While we won’t cover all of these today, many are featured on the Making Tracks print available on the Wheels That Won The West® site. Clearly, for any subject to be fully appreciated, its elements must be understood. Plus, once we have a good grasp of the terms, it’s easier to communicate and convey the significance of every surviving heavy transport. The term ‘drag shoe’ refers to a wagon accessory used in tandem with the braking of the rear wheel(s) during rugged downhill travel. 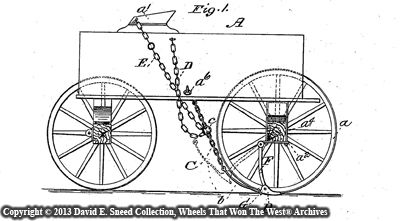 As seen it the photo above, its heavy, cast metal design is engineered to allow wagon and coach wheels to ride on it in order to save wear and tear on the metal tire. 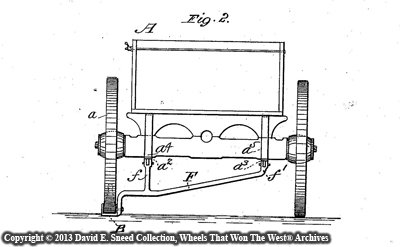 As part of this arrangement, the wheel is locked in place by a chain and the resulting drag helps slow the vehicle’s descent. Like other elements of horse drawn vehicles, drag shoes came in a wide variety of sizes and styles as well as patents. One such patent was both applied for and granted in 1892. Optimizing a vehicle driver’s time, convenience, load safety and equipment security, Gustave Homes of St. Louis, Missouri proposed an automatic drag shoe device that would be attached to a wagon. This innovation was engineered in such a way that it could be lowered and raised without ever leaving the driver’s seat and relinquishing control of the draft animals. Also part of the patent, an accompanying calk (see below) could be attached to the shoe to add even more ‘bite’ and drag while descending particularly dangerous inclines. 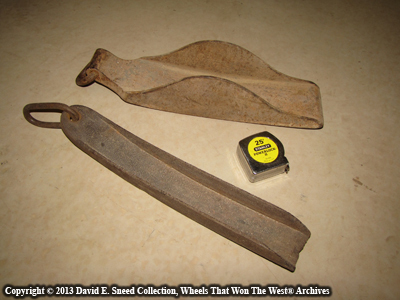 While we’ve never seen evidence of this device on a wagon, individual drag shoes of all sizes and types have become much sought after by collectors and enthusiasts. 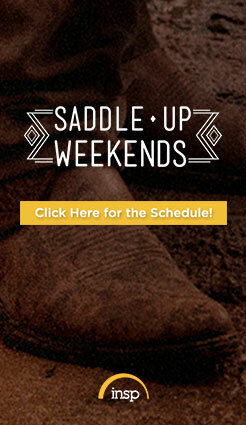 The Wheels That Won The West® collection spans more than two centuries of horse drawn vehicle manufacture. 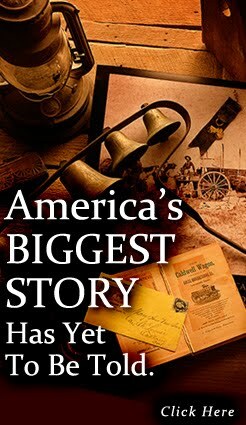 It contains scarce imagery, specifications, correspondence, promotional literature & other all-but-forgotten historical details of the workings of America’s early western transportation industry. The subject is a huge and virtually untouched aspect of western study; rich with untold stories of personal, corporate & national dreams. Focusing on the heavier farm, freight, ranch, coach, business & military vehicles that built the western frontier of the U.S., our research and articles have been published by the American Chuck Wagon Association, National Stagecoach & Freight Wagon Association, Santa Fe Trail Association, The Carriage Journal, Farm Collector, Driving Digest & Wild West magazines as well as the Wheels That Won The West® website & numerous other traditional and on-line publications. Complementing our commitment to research, publishing, entertainment & promotional projects, we are frequently called on for vehicle consulting, identification & authentication work. If you have a question about our products & services, please drop us a line. We’d love to hear from you.